Ubisoft CEO Yves Guillemot has confirmed in a company earnings call that the long-planned cinematic adaptation of the Assassin’s Creed gaming series will indeed hit cinema screens on December 21, 2016, and, moreover, has officially started production. The parkour-fuelled historical killing spree is finally happening, most likely directed by Snowtown and Macbeth director Justin Kurzel – though quite in what form remains to be seen. Currently shooting Danny Boyle’s Jobs movie, Fassbender looks set to take on the role of Desmond Miles – originally voiced by Nolan North, the man behind Uncharted’s Nathan Drake and many more – as well as his bloodletting ancestors. The plot in of itself is still unconfirmed, but in all likelihood, the film will use Assassin’s Creed II’s Italian renaissance time period and setting. For anyone unaware of Assassin’s Creed’s set-up, the games’ stories revolve around an unassuming barman drawn into a fantastical world of assassins’ guilds. Travelling through history, he’s asked to relive his ancestor’s lives through the magic of cutting-edge DNA technology. By October 2011, Sony Pictures was in final negotiations with Ubisoft Motion Pictures to make a film version ofAssassin’s Creed, to be released in 3D. In July 2012, Michael Fassbender was announced to star in the film, as well as co-produce the film through his DMC Film banner with Conor McCaughan. 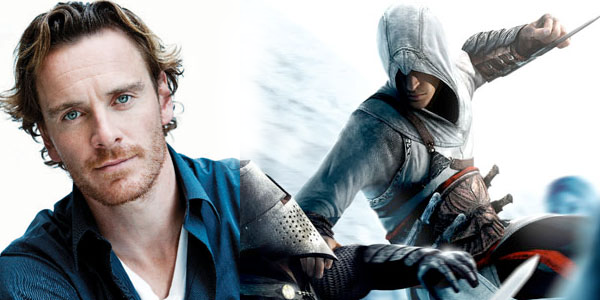 Jean-Julien Baronnet, CEO Ubisoft Motion Pictures, said Fassbender was the studio’s first choice to star in the film. Negotiations between Sony Pictures and Ubisoft Motion Pictures were put on hold, with Ubisoft executives planning to develop the film independently in order to maintain greater creative control. Sony could still distribute the film, but Ubisoft Motion Pictures would not resume talks until packaging the project with a writer and director. In October, Ubisoft revealed the film would be co-produced with New Regency and distributed by 20th Century Fox. New Regency will finance part of the film’s production, in order for Ubisoft to not shoulder much financial risk, yet still be involved creatively. Baronnet also revealed Ubisoft hoped to release the film along with a new game launch for the series. In January 2013, Michael Lesslie was hired to write the film. In May, it was announced that the film was to be released on May 22, 2015, which was later pushed back to June 19, 2015. In June 2013, Frank Marshallentered negotiations to produce the film, along with Fassbender and McCaughan for DMC Film and Eli Richbourg for Ubisoft. In July, Scott Frank revealed he was rewriting the script. In November, the film was pushed back once again to a new release date of August 7, 2015. In January 2014, a Linkedin profile for executive producer Fannie Pailloux stated filming was scheduled to begin in August 2014. In April 2014, Adam Cooper and Bill Collage were hired to rewrite the script. By the end of April, Justin Kurzel was in talks to direct. In June, Olivia Munn expressed interest in appearing in the film.